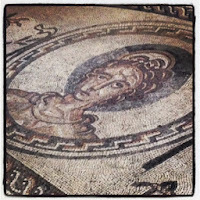 There could not have been a more appropriate date to begin a Roman inspired post than yesterday - the Ides of March - notorious as the date of the assasination of Julius Caesar in 44 BC and commemorated by classics boffins everywhere. It was Julius Caesar, of course, who first invaded Britain long before its later conquest from AD 43 under Claudius. 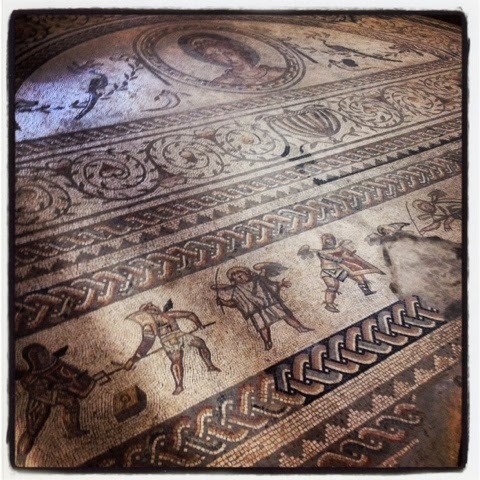 We are lucky to live in a Roman city - St Albans - which has a fascinating and very toddler-friendly little museum dedicated to this part of its history, which we visit regularly to dress up as legionaries, build arches and look at the fantastic finds from nearby. This week, however, was a real treat. 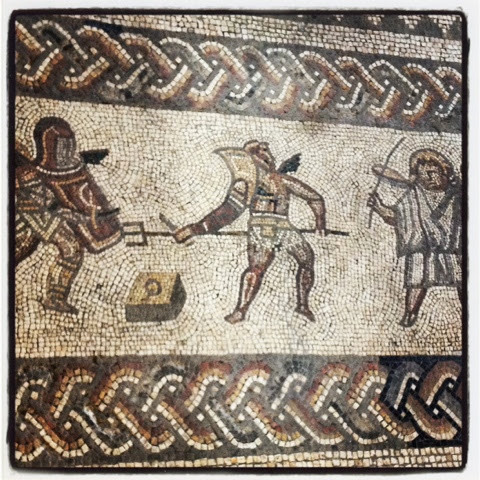 We've been exploring West Sussex, our inlaws' new pad, and a county so rich in Roman remains it could be accused of glutony. 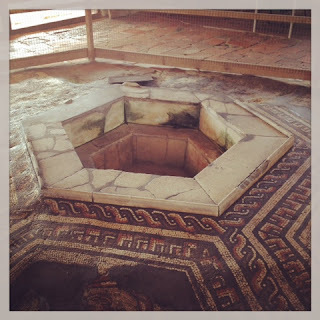 We visited a large ancient Roman farm in situ called Bignor Roman Villa, discovered in 1811 when a farmer ploughing his fields hit a rather fabulous jackpot; a stone dining room pool. 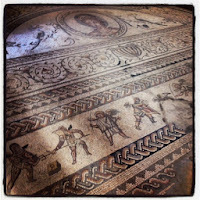 He must have been amazed at what was ultimately uncovered below his land - sprawling rooms, stunning mosaics, bathhouses and artefacts. We were therefore only the latest in a long line of tourists to this important site, starting with the Georgians. This visit was also a fabulous trip down memory lane for me, conjuring up those warm and fuzzy memories of childhood holidays when these sorts of places really brought the past alive. I had visited and loved this villa as a child and I was delighted to find that I have never found it so difficult to extricate my toddler from a museum. The site is set against the stunning backdrop of the South Downs and we caught it on a glorious sunny day - certainly the best weather for a visit (a good chunk is outdoors). Perhaps due to nostalgia, perhaps because of the peace and quiet and the extremely friendly staff, we felt really at home here - free to play, sing, explore and sprawl on the lawns. 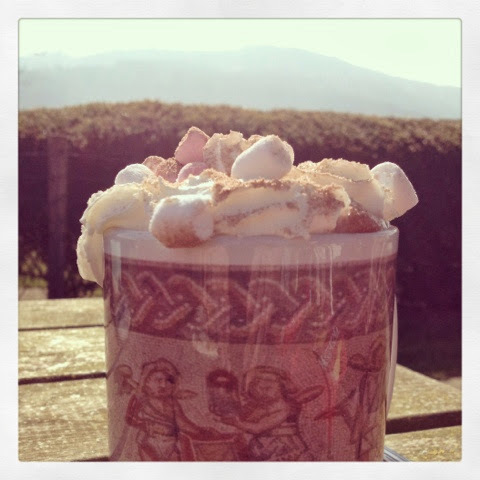 There were a few other visitors, but they were equally relaxed; meandering through the rooms and grounds in the sun, sipping hot chocolate and eating home made cakes and ice-cream. We began our visit by looking at some of the artefacts in a small museum area. To be frank these cases need some updating and investment, and I suspect they haven't changed much since I visited 25 years ago (*pauses to consider reality of own antiquity with horror), but Culturebaby still enjoyed spotting items that relate to her own everyday experiences and looking at the model of the farm as it would have been - though I did have to lift her up. The children's play area was a real hit. It contained a selection of books and some well chosen items guaranteed to engage a range of ages. For the very young it provided a toy farm (the original function of Bignor), a toga to try on and a selection of puzzles and tessellating shapes. 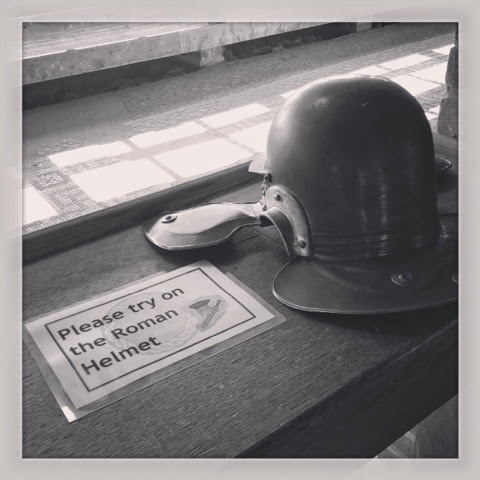 For older children (and indeed adults) there was a Roman numeral sorting game, a helmet to wear, puzzles and a mosaic to create. As Culturetot napped, Culturebaby actually abandoned her ice-cream to head back into the villa for the third time, did two more laps and settled down again to work with the farm. 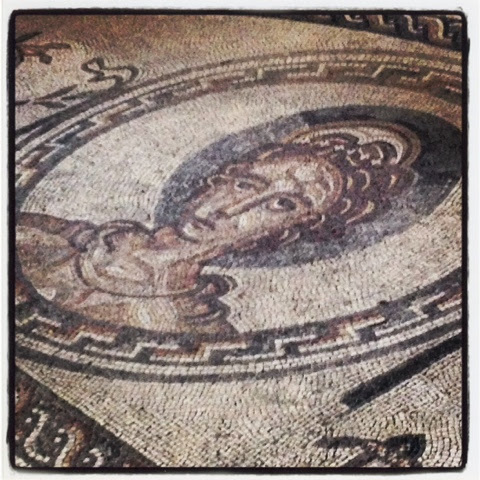 She was so absorbed that I resigned myself to a cathartic few minutes of peace to complete a mosaic. When it came to the point at which we finally really had to leave she even launched a sit down protest amongst the daisies and declared that she did not want to go back to the car. Peversely of course I consider this a success. 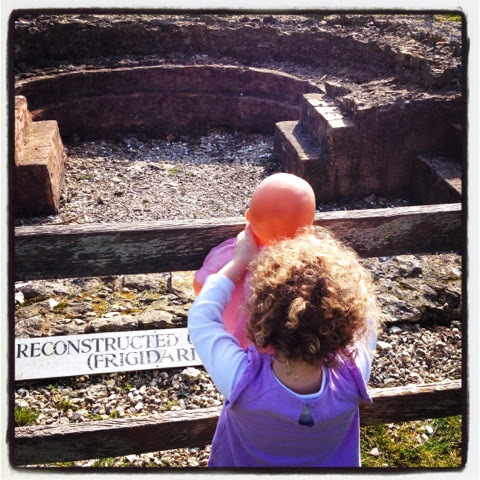 These sort of trips to a site where a tot can handle artefacts, play, walk around freely and experience the historic space are really important. I've mentioned before that Maria Montessori believed that the child under six has a capacity for taking in the whole of their environment by just existing within it - like a sponge soaking up moisture from its surroundings using all of their five senses. 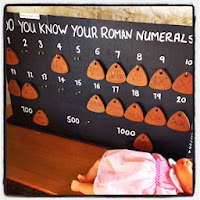 We are lucky in Britain with our wealth of Roman sites such as Chedworth (see here), Bath, Fishbourne and a great range of others on this Telegraph list. Many provide great family activities too. I. As we say, you can't beat a site visit, trip to a good museum or, if you can catch one, an opportunity to see a re-enactment. Bignor has a few of these over the summer, and so do a number of other sites. II. Look at good images from books for other ages. See what takes your toddler's interest. 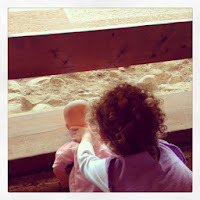 I never fail to be surprised by the observations Culturebaby is beginning to make or details she remembers. III. We are rather in love in our household with Safari Ltd's educational models. These accurate and hand-painted figurines are a wonderfully tactile way to introduce the Romans into play. 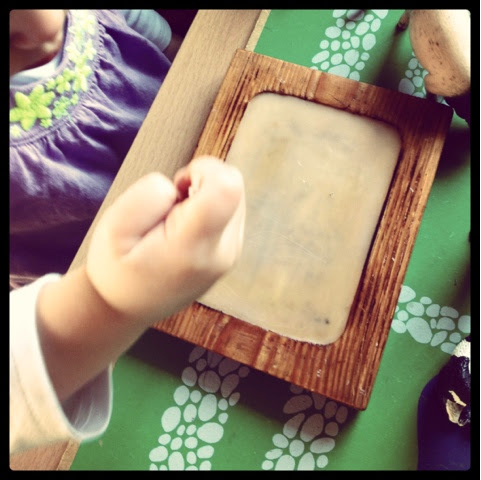 Between 18 months and 4 years is Montessori's 'sensitive period' for interest in small objects (the time our little sponges really show an interest in and concentrate on this area). This is so evident with Culturebaby's play with small models like these. She lines them up and orders them, uses them in imaginative play and carries them around with her. 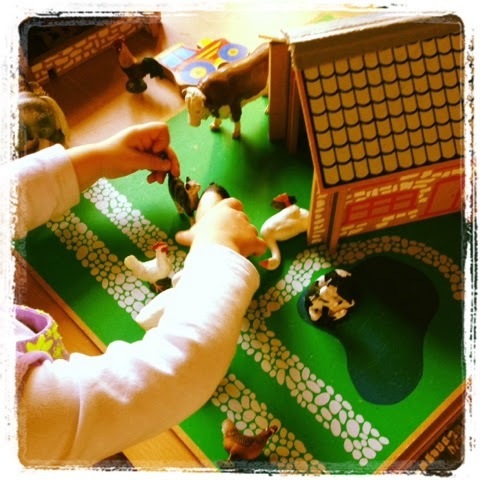 Though they are small and warn against being used by under threes, a supervised two year old can also get a lot out of exploring them. I can imagine that these TOOBs will be versatile enough to be used throughout childhood for a large range of educational activities, which makes them great value and a wonderful resource to collect. At present Culturebaby is fairly indifferent to appropriate period and contexts and is perfectly happy to give Caesar a ride on her merry-go-round, or seat a tired Legionary down in front of the television, but while she does this she learns names and takes in details. They become part of her imaginative world. 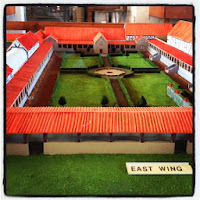 Next I plan to do some specific activities using these models - perhaps some matching of them to photographs and images. Our lucky legionary is also shortly destined to be a feature in our soon-to-be-created Easter resurrection garden. IV. 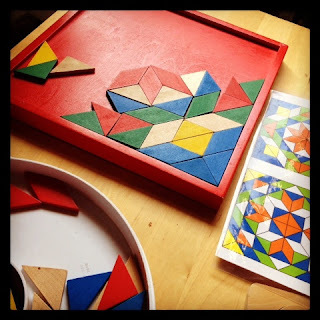 Play with mosaics and introduce tessellated shapes. Bignor sells a great make-your-own mosaic coaster kit for £2, which we will be using in a little Roman busy-bag for play. We also own a couple of sets of wooden shapes that tessellate to create patterns. 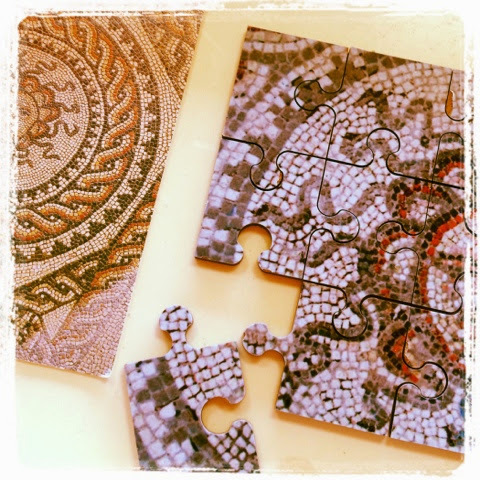 These are great for all ages, but I'm looking forward to introducing them to Culturebaby shortly as they give much more scope than jigsaw puzzles, with their assigned pieces, for creativity. V. Dress up - create a toga from a bedsheet or a soldier's simple tunic from a piece of felt and a belt. 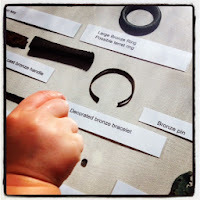 Culturebaby is beginning to love this activity and was utterly delighted to find a Roman themed dressing-up box in our local museum on our most recent visit. VI. 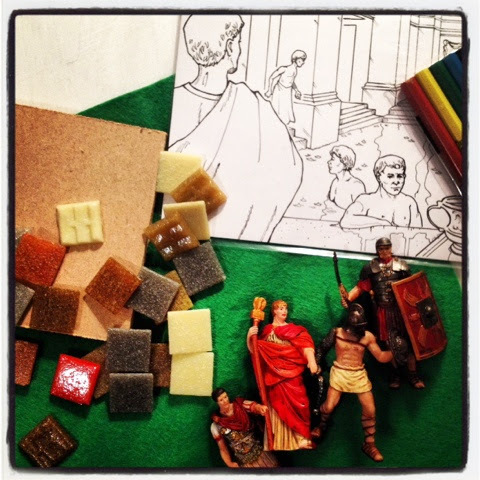 We bought these great little colouring cards from Bignor Roman villa. While Culturebaby is little and not yet very dexterous at actually colouring things in - though she certainly has the enthusiasm for it - I thought I'd do a few copies of these so she can use them a few times. We will also be able to match some of our figurines to characters in these scenes. VII. Do some building together with blocks. Talk about the fact that the Romans invented the arch, built straight roads and aqueducts. Try to build a simple temple or bridge. IX. 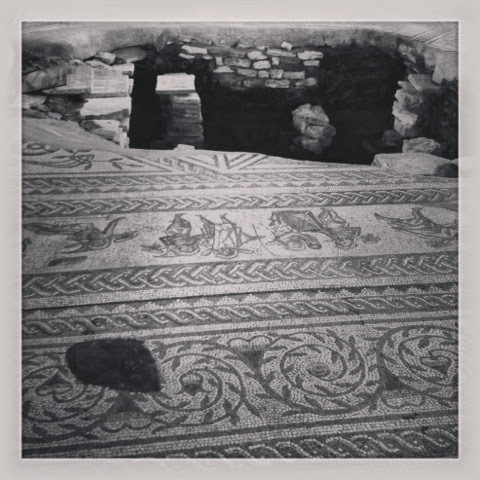 Set up your own archaeological dig. I plan to do this for Culturebaby soon now the weather is getting better. All you need is a sandpit or sandtable and a selection of objects. An easy way to produce a great puzzle is by drawing on a simple plantpot and then breaking it into a few pieces and burying them (obviously ensuring there are no sharp bits). We have some of these coins to add to the mix, and I'd also throw in some weathered glass if I can find some on our next beach trip, perhaps some seafood shells and animal bones, plus a couple of bits of old jewellery and beads. If you can find any appropriate little stone statues too these could work well. Do let us know if you try any of these out. 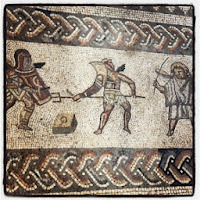 We'd love to hear how your little legionaries get on. 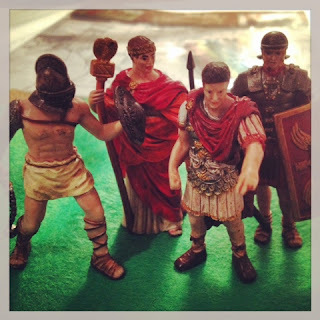 Disclaimer: Safari Ltd, kindly sent us 4 of their Roman figurines to test through their UK distributor Asobi Toy Company. All opinions are however very much my own. We love this product. Fantastic post! We live very close and I'm ashamed to say that I've never visited, but after your wonderful account of your day I'm definitely adding it to my list. It looks like a great place where little ones can really get involved with learning and exploring. Thanks for sharing your day! Great post. 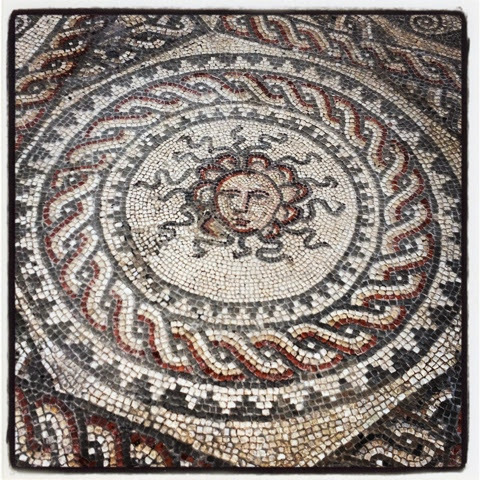 How fortunate you are to live in a Roman city and have this museum as a resource. I dream of visiting Rome (and environs like Ostia Antica) one day with my children. 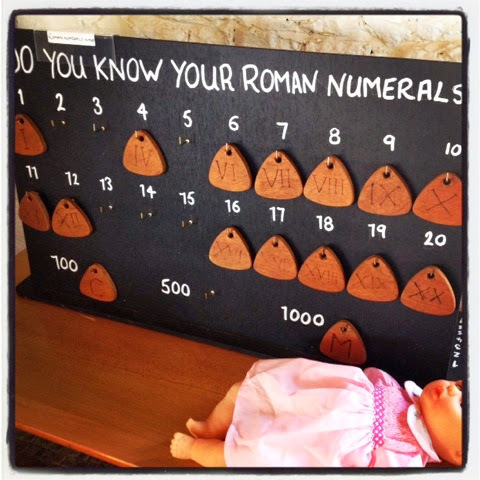 Love your use of Roman Numerals!